On March 21, Simon Fraser University (SFU) First Nations Student Association (FNSA) invites you to come and witness the annual event, Indigenous Success Stories. This event is part of FNSA Indigenous Day and features four amazing Indigenous storytellers from different areas of British Columbia who will share their journeys, expressing the adversity and perseverance each has faced throughout their lives. In additional to this panel, there will also be an SFU Co-op student who will share her story of success. The event includes a traditional Indigenous dinner, providing attendees a chance to share a meal together and engage with storytellers and one another. 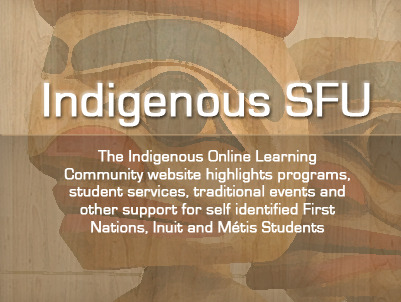 This is a chance to engage in our SFU Indigenous community as well as with those closely connected to SFU. The Indigenous Storytellers who make up the speaker panel for this event come from various walks of life and will discuss their backgrounds, education, obstacles they have had to overcome, in addition to their career paths. Storytellers will share their stories and answer questions, each bringing a unique perspective as they hail from different organizations, industries and Nations. Merle Alexander is an Aboriginal lawyer practicing Aboriginal law. He is from the Tsimshian Nation, Kitasoo Xai'xais First Nation, otherwise known as Klemtu, BC, and his family crest is Raven. He is the grandson of Viola and Joseph Hopkins (Councillor for over 22 years), son of Stella Alexander (woman extraordinaire and Councillor for two terms) and brother of two amazing sisters, Marcy and Melanie. His wife is Tamara Napoleon of Saulteau First Nations in Treaty 8 Territory and their son, Elijah, is truly their pride and joy. Merle practices Aboriginal resource law combining Aboriginal, business and environmental law. He is a Partner in the Vancouver office of Gowlings and their national Aboriginal Law Group where they focus on Aboriginal sustainable development, balancing economic development, respect for Aboriginal rights and environmental conservation for future generations. His professional and personal passion is the protection of Aboriginal intellectual property rights, particularly traditional knowledge. Through his work, he has gained extensive experience in negotiating government-to-government agreements in BC and the Yukon and treaty chapters on Heritage Resources. He has also drafted protocols and represented national Aboriginal organizations in various United Nations forums. Merle is the recipient of Business in Vancouver's 2009 "Top Forty Under 40" award and is considered to be an international expert on protective mechanisms of Indigenous knowledge. Manager of the Natural Resource Department for Nak’azdli Whut’en, Colleen Erickson is committed to the age old environmental practices of the Dak’elh people; looking after the land in order that it may sustain us and future generations. A former two-term Chief of Saik'uz First Nation, Colleen is a recognized community leader, veteran member of the RCMP and has instructed part time at the local college, mostly in Aboriginal Studies. She is a Dak’elh grandmother (Ut'soo) and member of the Lusilyoo (Frog) Clan. Colleen spends a lot of time on the land with her family to ensure the teachings are carried on to the younger generations. She has served as a board member for various organizations and is currently a board member of the First Nations Health Authority of British Columbia. Colleen completed a Master's degree at Simon Fraser University in Education where she focused on traditional philosophies of Carrier teachings. Colleen is an active community member with extensive cultural and traditional knowledge who believes that cultural identity, which is tied directly to the land, is the foundation of health, wellness and sustainability for the people and the land. Sarah John is Dak’elh from Saik’uz First Nation belonging to the Lusilyoo (Frog) Clan. She is the Aboriginal Liaison Coordinator and part-time instructor for the College of New Caledonia in Vanderhoof, BC, mostly in Aboriginal Studies. She graduated in 2007 from SFU with an undergraduate degree in Sociology. After the completion of her degree, she returned home to help with the creation and implementation of the Aboriginal Service Plan. In 2011, Sarah graduated from SFU with a Master’s degree in Education with a focus on curriculum and instruction. Sarah is also working towards a Doctorate in Education that is focused on culturally inclusive place-based learning. She uses story telling as a tool to teach local Dak’elh culture and history. Sarah believes in the importance of the language and the land for the well-being of future generations. Shana Labatch is from Saik’uz First Nation. Having explored the arts from childhood, she has worked as an educator, sign-painter, graphic artist and portrait artist. Currently, she is using mostly acrylics and mixed media to produce emotionally-charged works and exploring writing, poetry, hide-tanning, beading, drumming, among other aspects of artistic practice, in order to better inform her work. Shana has exhibited her work in group regional art shows and has completed commissioned work for Yinka Dene Language Institute, Oxford University Press, the College of New Caledonia as well as for private individuals. She has honed and stretched her artistic practice through Simon Fraser University’s Master of Arts Education Program, receiving a Master of Education in October 2011. Her inspirations include absorbing family history, local history, landscapes, culture and language. Shana reaches through branches of her heritage; First Nation Dakelh and the settler culture (which includes Norwegian and Bohemian roots) and calls herself a "dual citizen". The drive to create comes from her desire to leave a healthy legacy for her children and grandchildren. She is deeply interested in gathering and cultivating holistic first people and settler ways of being and seeing, in contrast to the overwhelming capitalistic culture that surrounds us all. She states, "History has not stopped! And we shall create for ourselves our own integrated artistic identity as individuals (both art and artist) and as a people." Shana hopes her works will stretch the viewer and illuminate possible paths out of distraction and disillusionment and towards that “real living” which we may long for. Theresa John is a Carrier Dene woman of the northern interior of BC community Saik’uz First Nation. She obtained a diploma in Criminology at the College of New Caledonia in 2011 and decided to transfer to SFU to complete her bachelor’s degree, but dropped out in Spring 2012. After overcoming a difficult journey of various transitions and cultural differences, she returned to SFU as a full-time student in Fall 2013 and will graduate this June with a major in Criminology and a minor in First Nations Studies. Theresa chose law as her career path due to the positive influence of her family, many of whom have valuable experiences working in the criminal justice system. Her mother served 30 years with the RCMP and her brother served 28 years in the force as well. Additionally, in witnessing her aunt graduate from Harvard Law, she was influenced to choose the path of becoming a criminal lawyer. After law school, Theresa plans to return to her home community to help facilitate and promote culturally appropriate justice initiatives that many Native communities struggle to achieve. Throughout her studies at SFU, Theresa has connected with inspiring peers, professors, and employers who all have taught her essential lessons and skills to apply and practice both professionally and as a community member. The FNSA has also provided an immense amount of cultural, academic, social and spiritual support in the completion of her studies at SFU through events, workshops and building relationships with fellow Indigenous peers. Theresa believes that it is a huge support connecting with other diverse Indigenous students in order to empower one another to complete their studies. As a Council Member of the FNSA, Theresa’s involvement in Indigenous Success Stories comes from the desire to empower and motivate current and future SFU students to achieve their aspirations and future goals. Please RSVP for the event through Symplicity. To visit the Symplicity log-in page, click here.